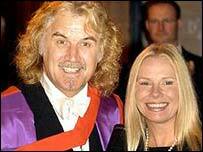 Comedian Billy Connolly has been appointed a CBE after three decades as one of Britain's top funnymen. The Glasgow-born performer's career has also spanned folk music and serious acting. The 61-year-old was named in the Queen's Birthday Honours list for his services to entertainment. Connolly started his working life when he left school at the age of 15 to become a welder in the Glasgow shipyards. His parents had split when he was aged four, leaving him to be brought up in a Glasgow tenement by his aunts. In a biography written by his wife Pamela Stephenson, Connolly said he was sexually abused by his late father. After working in the shipyards he served in the parachute regiment of the Territorial Army. 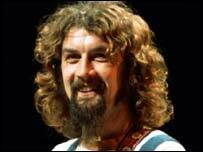 His performing career began as one half of folk group The Humblebums, which he formed with Gerry Rafferty. The duo appeared in a Royal Command Performance and released two albums. However, he started to put his comic monologues before his music and established a reputation as a comedian. Connolly - nicknamed The Big Yin - launched his solo stand-up career in Scotland before going on to become a household name across the UK in the early 1970s. His live shows were initially as well known for his prodigious swearing as for his jokes, but he soon became a regular fixture on British television. In more recent years Connolly forged a career as a serious actor. His greatest success came in the 1997 film Mrs Brown, earning him a Bafta nomination for his role as the faithful servant to Dame Judi Dench's Queen Victoria. Connolly had two children with his first wife, Iris Pressagh. The couple split in 1985 after 16 years of marriage, and four years later he married comedian turned psychologist Pamela Stephenson. Her biography of her husband, entitled Billy, has sold more than 1.6 million copies. The couple have three daughters. In 2001 Connolly was awarded an honorary degree by Glasgow University for his contribution to Scottish arts and popular culture. He became the face of the National Lottery last year. However, the "Don't live a little, live a Lotto" campaign was recently voted the most irritating advert of 2002. Roger Moore, David Beckham and Jamie Oliver are honoured by the Queen. Who's missing from honours list?